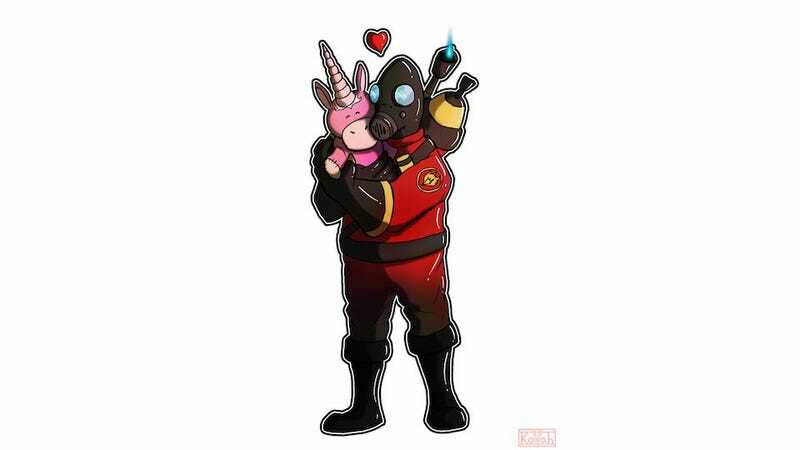 First up is the image above, which was drawn just a few hours after the Pyro trailer was released. You can find more of Kovah's work over on the dedicated deviantART page. Hello Kotaku, and welcome to the thread where you pass judgment on the heads of your fellow readers. This Man's Making a Game About His Native Iran. So, Of Course, They Branded Him a Spy. This Man’s Making a Game About His Native Iran. So, Of Course, They Branded Him a Spy. Kirk Hamilton takes an in-depth look at the uniquely challenging process of writing video game dialogue, and the many humorous ways it can go wrong. Have you been feeling a distinct lack of Final Fantasy IV in your life lately? Why Don't Video Game Characters Get More Excited About The Amazing Stuff They Do? Why Don&apos;t Video Game Characters Get More Excited About The Amazing Stuff They Do? Kirk wonders why video game characters aren't a bit more enthusiastic about the mind-blowing stunts they pull off every day. Wonder What Your First Wii U Experience Might Be Like? This Was Mine. Nintendo Seems Ready To Give Up On 3D. And That's A Good Thing. Nintendo Seems Ready To Give Up On 3D. And That&apos;s A Good Thing. I like the Wii U. I like it a lot. I&apos;m partially writing in the abstract. Why Do People Care About JRPGs?